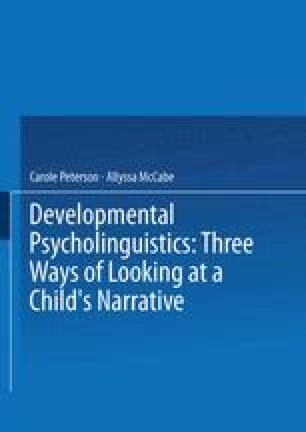 Because the story-tellers in the present study are children instead of adults, some attention should be focused upon recent debate over the characteristics of children’s narratives. This debate has centered around children’s ability to construct temporally ordered sequences in their stories. Piaget (1960,1969) and Fraisse (1963) have maintained that preoperational children are unable to reconstruct a temporally ordered series of events. In Piaget’s words, “before the age of 7 or 8, children’s narratives ... remain purely egocentric, ie. events are linked together on the basis of personal interest and not on the real order of time. If the child is asked to retell a story, to construct one from two pictures, or to re-arrange a series of shuffled drawings, he will simply jumble together a host of unrelated details, pairing two of them at a time” (Piaget, 1969, p.272). Fraisse (1963) also claims that children jumble the correct sequence of events when retelling stories, and that the order in which they retell stories reflects their interests and associations more than it does reality.